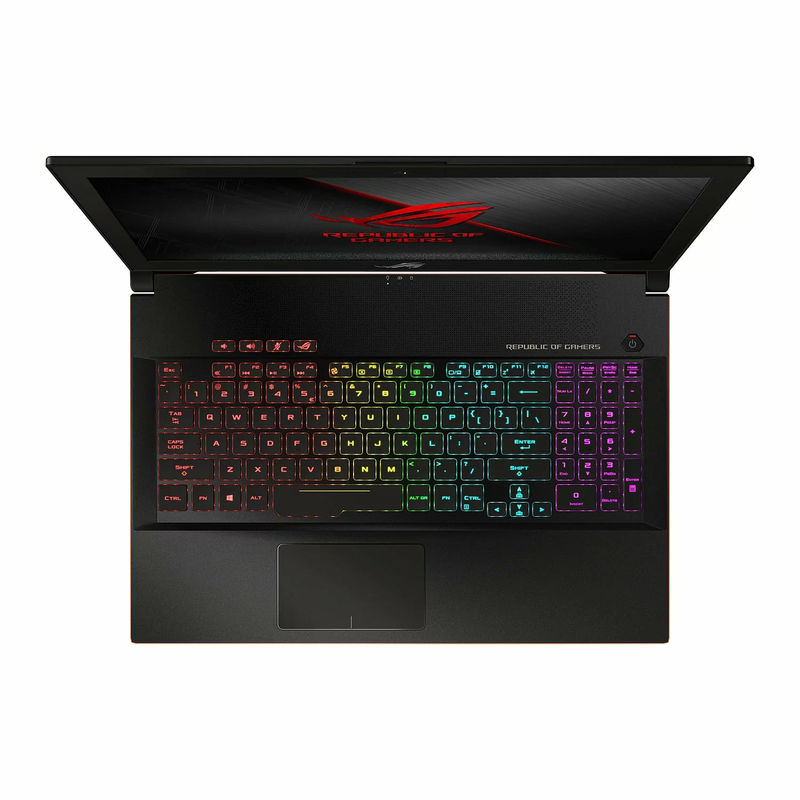 ROG Zephyrus M picks up where its predecessor, ROG Zephyrus, left off — delivering mighty performance in a minute package. 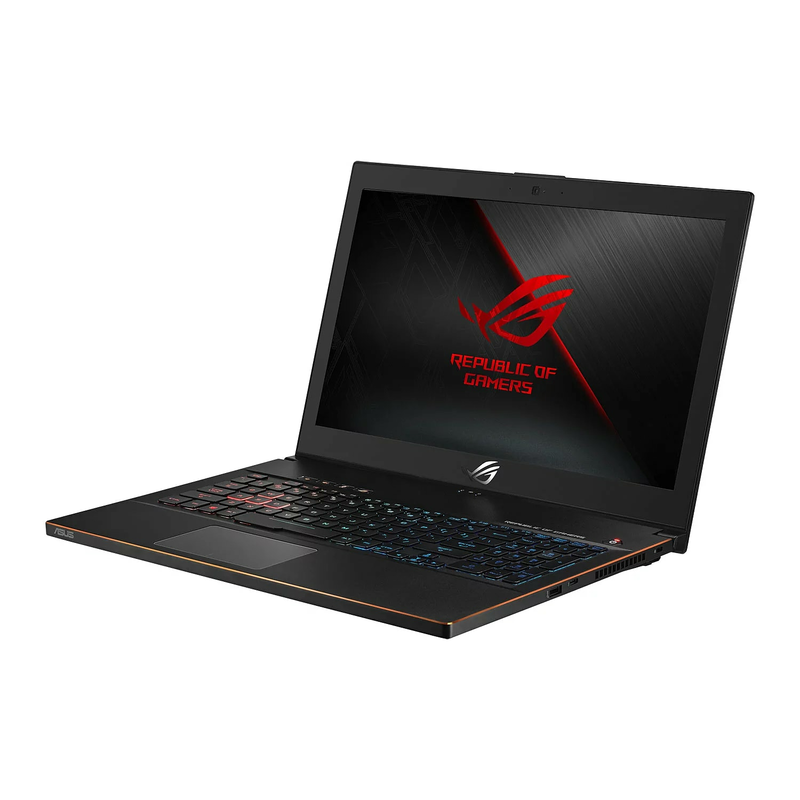 It’s powered by up to an 8th Generation Intel® Core™ i7 processor and NVIDIA® GeForce® GTX 1070 graphics, and features an IPS-level display with a superfast 144Hz refresh rate, lightning-quick 3ms response time, and NVIDIA G-SYNC™ technology. The revolutionary Active Aerodynamic System (AAS) ensures Zephyrus M runs cool and quiet even at high processor loads. ROG-exclusive software lets you switch between integrated and discrete GPU modes — the Optimus power-saving mode gives you impressive battery life, while the G-SYNC mode lets you experience its graphics prowess in all its glory! • High Performance Slim Gaming Laptop. • Latest 8th Gen. Intel i7 8750H 6-Core Processor with Hyper-Threading Technology. • GeForce GTX 1070 Graphics with 8GB GDDR5 Memory. • 144Hz 15.6” Anti-Glare IPS-Level Full HD Display with NVIDIA G-SYNC, 3ms Response Time & 72% NTSC coverage. • 16GB of 2666MHz DDR4 Memory, expandable up to a total of 32GB. • Ultra-Fast 512GB M.2 PCIe NVMe SSD Combined with a Massive 1TB Seagate FireCuda Solid State Hybrid Drive. • Aura 4-Zone RGB Chiclet Gaming Keyboard. • Built-in Gigabit LAN, 802.11ac WiFi & Bluetooth Connectivity. • Features USB 3.1 Gen1 Type-A Ports, along with HDMI 2.0. • Thunderbolt 3 / USB 3.1 Gen2 with Reversible Type-C connector provides the ultimate in connectivity. • Windows 10 64-bit Operating System. A brushed aluminium finish with a Black Titanium and Plasma Copper colour scheme give Zephyrus M a modern and sophisticated look that sets it apart from other gaming laptops. ROG engineers found the sweet spot for maximum cooling performance and effective thermal management. They’ve managed to shoehorn the NVIDIA GeForce GTX 1070 graphics card, AAS system, and two anti-dust fans into a thin 17.5-19.9mm chassis to ensure Zephyrus M offers exceptional performance during gaming marathons. Zephyrus M brings gaming desktop-level performance to the gaming laptop scene. It’s powered by an Intel® Core™ i7 Processor with 16GB of DDR4 2666MHz dual-channel memory, and NVIDIA GeForce GTX 1070 graphics. The innovative AAS ensure additional cooling to cope with demanding gaming marathons. In addition, to house your extensive game library, Zephyrus M features cutting-edge storage, including a 512GB M.2 NVMe PCIe® 3.0 x4 SSD and a 1TB Seagate® FireCuda™ SSHD. 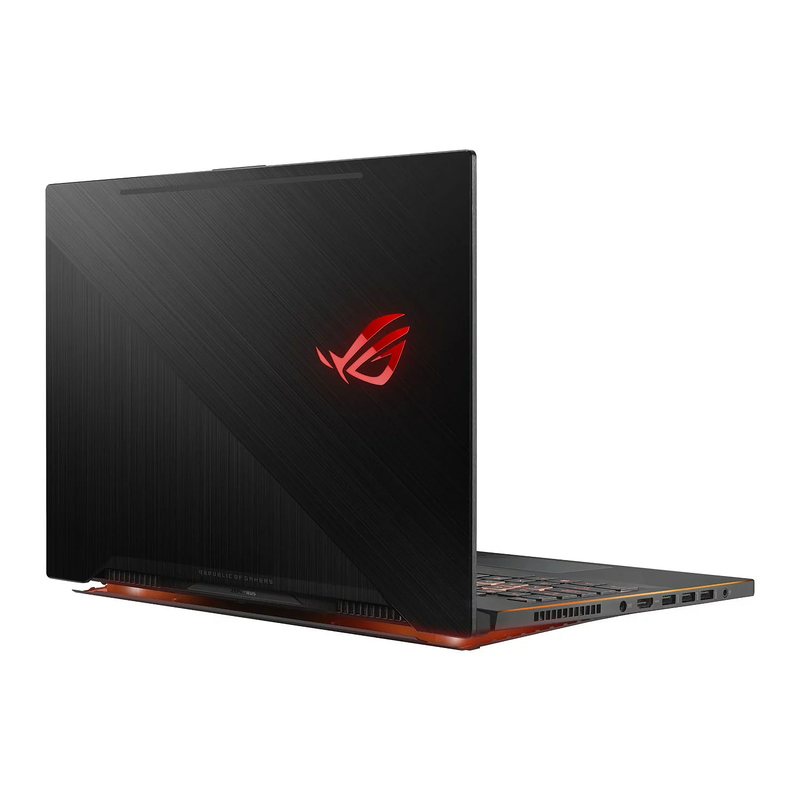 The ultra-responsive 15.6-inch IPS-level display boasts a 144Hz refresh rate, 3ms response time, and NVIDIA G-SYNC technology to provide super smooth and seamless visuals. The IPS-level panel has a wide 72% NTSC colour gamut that guarantees great contrast and colour reproduction for exceptional true-to-life visuals, while wide-view technology ensures colours stay true, even when viewed from angles of up to 178°. It’s time to play the latest AAA games at maxed-out settings without visual tearing, lag, ghosting or obvious stutter! NVIDIA G-SYNC technology synchronises the display’s refresh rate with the GPU’s frame rate to make gameplay silky smooth. G-SYNC minimises perceived stuttering, reduces input lag, and eliminates visual tearing all without affecting system performance. Welcome to the smoothest and fastest gaming experiences yet! • Ultra Smooth: No Stutter. Outshine the competition with Aura Sync! Light up Zephyrus M with customisable RGB LEDs and sync it up with Aura Sync-enabled accessories like gaming mice, headsets, keyboards, and other peripherals. Aura Sync offers several unique preset lighting modes, including colour cycle, music synchronisation, and CPU temperature; you can even program your own colour scheme to reflect your own style. Zephyrus M comes with Intel Thunderbolt™ 3, enabling a total of 40Gbps of bandwidth for data and display-signal streams, combined. On-board Intel® Thunderbolt™ 3 technology enables a total of up to 40Gbps bandwidth for data and display-signal streams, combined. Its USB-C connector makes it the most advanced and versatile port available — providing single-cable docking and connections to up to two UHD displays. With Thunderbolt 3, Zephyrus M opens up a world of possibilities, all via a single port. ROG GameFirst V technology maximises throughput for your game! It prioritises network packets for increased bandwidth for online gaming and streaming. The new multi-gate teaming function combines up to four gateways to ensure the very best online gaming experience. With Aura RGB, it’s easy to customise the colours of the ROG Zephyrus M keyboard’s backlit keys, as well as the four zoned areas. Explore nine fun and fascinating illumination effects, such as Breathing, Colour Cycle or Rainbow mode. Create individual key colours for every game to master its controls and even customise the front logo to match your mood or style.